The Pueblo Revolt of 1680—also known as Popé's Rebellion—was an uprising of most of the indigenous Pueblo people against the Spanish colonizers in the province of Santa Fe de Nuevo México, present day New Mexico. The Pueblo Revolt killed 400 Spanish and drove the remaining 2,000 settlers out of the province. Spanish colonial policies in the 1500s regarding the humane treatment of Indians were difficult to enforce on the northern frontier. With the establishment of the first permanent colonial settlement in 1598, the Pueblos were forced to provide tribute to the colonists in the form of labor, ground corn and textiles. Encomiendas were soon established by colonists along the Rio Grande, restricting Pueblo access to fertile farmlands and water supplies and placing a heavy burden upon Pueblo labor. Especially egregious to the Pueblo was the assault on their traditional religion. Franciscan priests established theocracies in many of the Pueblo villages. The priests converted the Pueblos to build the Spanish empire in New Mexico. In 1608, when it looked as though Spain might abandon the province, the Franciscans baptized seven thousand Pueblos to try to convince the Crown otherwise. 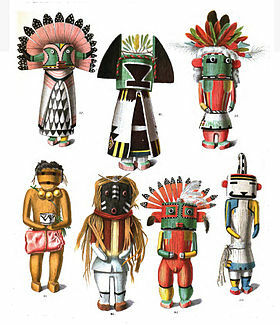 Although the Franciscans initially tolerated manifestations of the old religion as long as the Puebloans attended mass and maintained a public veneer of Catholicism, Fray Alonso de Posada (in New Mexico 1656–1665) outlawed Kachina dances by the Pueblo Indians and ordered the missionaries to seize and burn their masks, prayer stick, and effigies. The Franciscan missionaries also forbade the use of entheogenic drugs in the traditional religious ceremonies of the Pueblo. Several Spanish officials, such as Nicolas de Aguilar, who attempted to curb the power of the Franciscans were charged with heresy and tried before the Inquisition. Following his release, Popé, along with a number of other Pueblo leaders (see list below), planned and orchestrated the Pueblo Revolt. Popé took up residence in Taos Pueblo far from the capital of Santa Fe and spent the next five years seeking support for a revolt among the 46 Pueblo towns. He gained the support of the Northern Tiwa, Tewa, Towa, Tano, and Keres-speaking Pueblos of the Rio Grande Valley. The Pecos Pueblo, 50 miles east of the Rio Grande pledged its participation in the revolt as did the Zuni and Hopi, 120 and 200 miles respectively west of the Rio Grande. The Pueblos not joining the revolt were the four southern Tiwa (Tiguex) towns near Santa Fe and the Piro Pueblos south of the principal Pueblo population centers near the present day city of Socorro. The southern Tiwa and the Piro were more thoroughly integrated into Spanish culture than the other groups. The Spanish population of about 2,400, including mixed-blood mestizos, and Indian servants and retainers, was scattered thinly throughout the region. Santa Fe was the only place that approximated being a town. The Spanish could only muster 170 men with arms. The Pueblos joining the revolt probably had 2,000 or more adult men capable of using native weapons such as the bow and arrow. It is possible that some Apache and Navajo participated in the revolt. 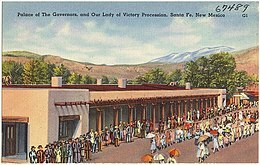 The Spanish were never able to re-convince some Puebloans to join Santa Fe de Nuevo México, and the Spanish often returned seeking peace instead of reconquest. For example, the Hopi remained free of any Spanish attempt at reconquest; though they did, at several non-violent attempts, try for unsuccessful peace treaties and unsuccessful trade agreements. For some Puebloans, the Revolt was a success in its objective to drive away European influence. 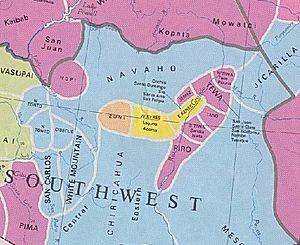 The Spanish return to New Mexico was prompted by their fears of French advances into the Mississippi valley and their desire to create a defensive frontier against the increasingly aggressive nomadic Indians on their northern borders. In August 1692, Diego de Vargas marched to Santa Fe unopposed along with a converted Zia war captain, Bartolomé de Ojeda. De Vargas, with only sixty soldiers, one hundred Indian auxiliaries, seven cannons (which he used as leverage against the Pueblo inside Santa Fe), and one Franciscan priest, arrived at Santa Fe on September 13. He promised the 1,000 Pueblo people assembled there clemency and protection if they would swear allegiance to the King of Spain and return to the Christian faith. After a while the Pueblo rejected the Spaniards. After much persuading, the Spanish finally made the Pueblo agree to peace. On September 14, 1692,  de Vargas proclaimed a formal act of repossession. It was the thirteenth town he had reconquered for God and King in this manner, he wrote jubilantly to the Conde de Galve, viceroy of New Spain. During the next month de Vargas visited other Pueblos and accepted their acquiescence to Spanish rule. In 2010, students Clara Natonabah, Nolan Eskeets, Ariel Antone, members of the Santa Fe Indian School Spoken Word Team wrote and performed their spoken word piece telling the story of the Pueblo Revolt, " Po'pay" to critical acclaim in New Mexico and the US. The team performed in the Baltic states of Estonia, Latvia, and Lithuania. The track can be found on iTunes. ^ a b Flint, Richard and Shirley Cushing. " Antonio de Otermin and the Pueblo Revolt of 1680[ permanent dead link]." New Mexico Office of the State Historian, accessed 29 Oct 2013. Ponce, Pedro, " Trouble for the Spanish, the Pueblo Revolt of 1680", Humanities, November/December 2002, Volume 23/Number 6.